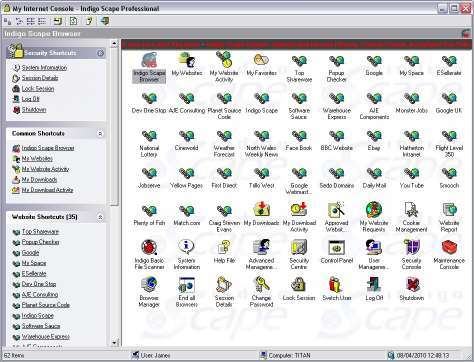 Indigo Scape Professional is an Internet Management and Security Software System for Microsoft Windows platforms. Indigo Scape features sophisticated Internet Filtering, Content Control, Acceptable Use Policies and Reporting allowing you to Monitor, Control and Restrict Access to all resources on the Internet. Indigo Scape offers complete centralized network management of all Internet resources effectively managing and reporting Internet use. Indigo Scape Professional Internet Management Security Software. Indigo Scape Professional is generally designed to be installed on client computers with the Administration controlled from the Enterprise products. Professional versions have basic Administration features built in but to manage and use advanced features will require an installation of Indigo Scape Enterprise on the Network. Protect images & pictures; add a name/logo/copyright notice as watermark. Qweas is providing links to Indigo Scape Professional 1.0.0.456 as a courtesy, and makes no representations regarding Indigo Scape Professional or any other applications or any information related thereto. Any questions, complaints or claims regarding this application Indigo Scape Professional 1.0.0.456 must be directed to the appropriate software vendor. You may click the publisher link of Indigo Scape Professional on the top of this page to get more details about the vendor.